The new 2013 Fusion by JP Australia is a universal wave machine. It is actually an all round board oriented towards wave performance. The board features a shorter and wider shape which makes it very stable, yet easy to maneuver in all types of waves. Due to its compact shape it can easily be fitted into any section of the wave. The Fusion packs some extra volume for optimal float and responsiveness. It uses a step deck that provides the use of extra volume while keeping thin rails. The board is quick, it planes fast and feels very agile. The 9’8″ and 10’2″ Fusions feature a single concave throughout running into a V towards the tail plus special noses that provide efficient lift when needed, while the 10’8″ features a wider outline and has a reduced V in the middle, running to an increasing V towards the tail. The V assures better maneuverability in bigger waves. All Fusion boards are equipped with a thruster fin setup which generates great grip and a nice speed. They have less directional stability since they are wave oriented, but they are easy to handle and fun to ride. 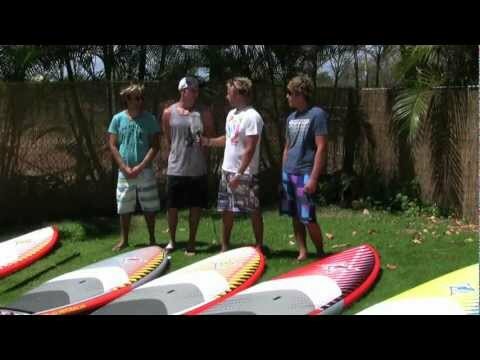 The Fusions are all-round boards which work great in flatwater and small to medium waves.